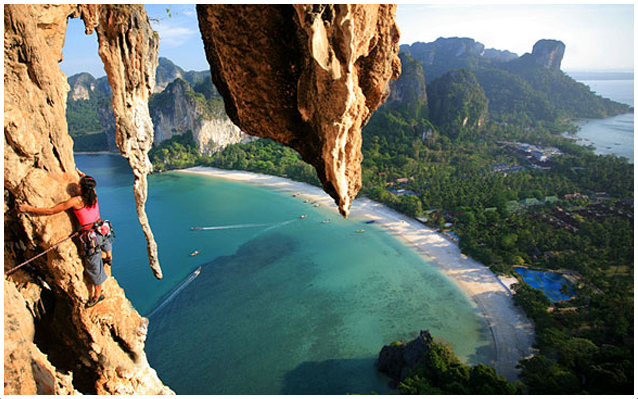 As plans get finalized for a Thailand adventure, don’t forget about Rai Leh (often referred to as Railay). The isolated town is one of Thailand’s best adventure spots. The hoards of tourists often pass it by for more accessible destinations, but any visit to Thailand just wouldn’t be complete without a stopping at this quaint ocean side villa. Unlike other popular destinations in Thailand, these beaches have well taken care of! Located just a quick long-tail boat ride from Krabi, Railay boasts loads of adventure for travelers - especially those with a thirst for heights. 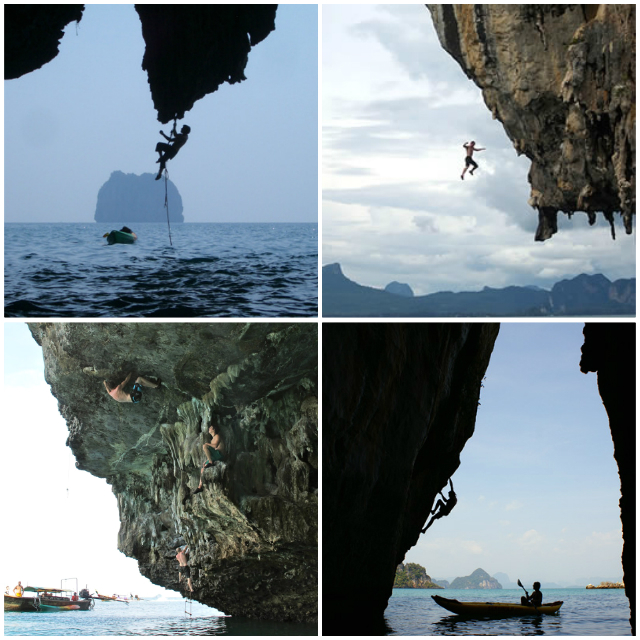 Railay is home to some of the world’s best rock climbing and tour companies have capitalized on this phenomenon. The peninsula is chalk (pardon the pun) full of fantastic spots to rock climb. Experienced climbers can find sufficient route beta online and head out on their own.The routes are open to everyone. Any necessary equipment can be rented from a number of guide shops in operation on Railay. Local guides are also available for hire at these shops. One note to consider: don’t allow limited climbing experience stop you from trying the sport. Even if you have zero experience understand there are a number of beginner routes that are safe and appropriate for every level. Guides will do all the heavy lifting, as well as provide climbing instruction and encouragement. Stop in at any number of climb shops for more information on guided tours. 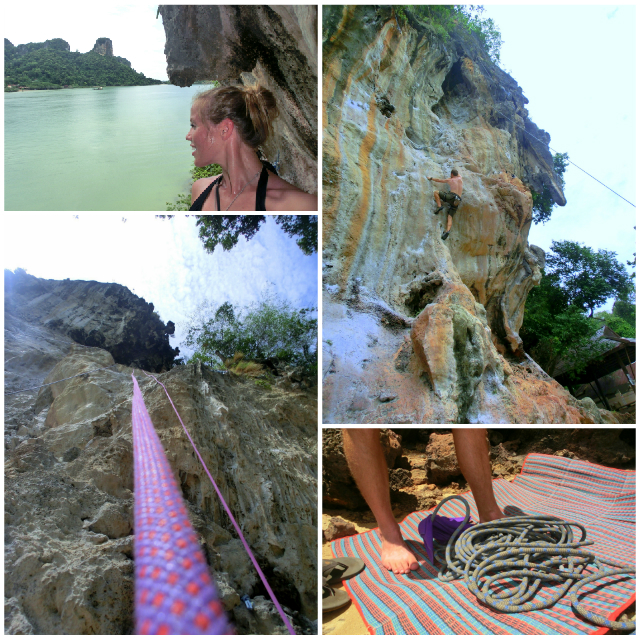 King Climbers is a popular shop as too is Railay Rock Climbing. The climbing shops are not hard to find with several located in the main part of town. Similar to rock climbing, deep water soloing involves limestone cliffs and deep ocean water. Essentially, climbers ascend (without ropes) these cliffs with just the water below. Most climbers don’t go very high on the cliffs and will either fall into the water or jumping in once the route is completed. The only way to get to the soloing spots is is to purchase a spot in a tour, which can be done at any climbing/tourist information spot in the city. For the record, most travelers recommend deep water soloing over climbing if it comes down to one or the other. There really isn’t much hiking on the peninsula but there is one primary option for those wanting get out and beat the path. The name of the trail isn’t very creative: Scenic Viewpoint Trail, and while it’s not very long it may present a little bit of a challenge as it goes straight up the mountain. The hike takes about 20-25 minutes to complete and is located on the path to Pranang Beach. 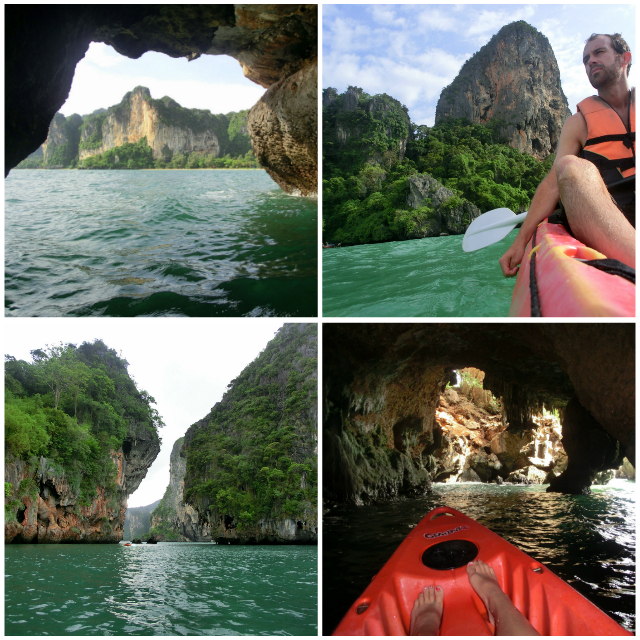 Kayaking is a great way to see Railay and the surrounding area. Most of the kayakers paddle out to the limestone cliffs rising from the sea. For the brave, these formations provide cliff jumping opportunities. A number of vendors rent the kayaks by the hour at Railay West and the hourly rate is fairly minimal. Don’t forget sunscreen. Places to stay in Railay range from backpacker hostels to luxury resorts. East Railay has no traditional beach and is the main arrival and departure point for all long tail boats making the east side occasionally noisy and not entirely picturesque. 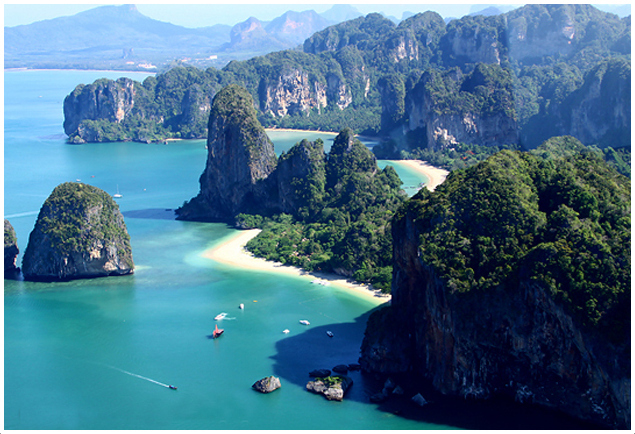 West Railay and Pranang Cave Beach, however, are absolute paradise. 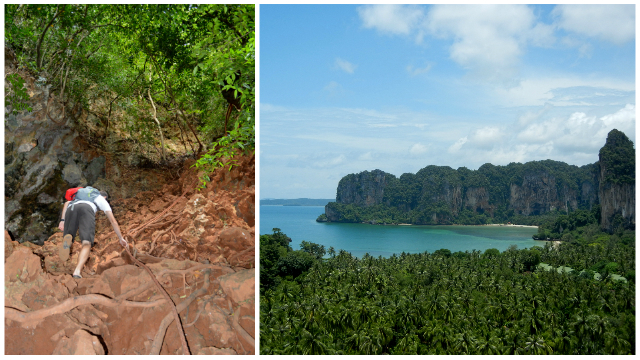 That all being said, the Railay peninsula is so small that everything is within a 5-10 minute walking distance. So if you're trying tot save your pennies, staying at a cheap hostel on the east side isn't all that bad as far as location goes. The lone exception to “everything in walking distance” is the backpacker gathering at Ton Sai Beach. Access to this beach and its growing collection of backpacker hostels requires a 20 minute walk or a few minutes via long tail boat.